Whistle pig, woodchuck, marmota monax, ground hog, Punxsutawney Phil, whatever you want to call the cute little booger, according to him spring is right around the corner! Wahoo! Groundhog day as we know it started on February 2, 1887 and was really the creation of apparently super bored editor of the Punxawtawney Spirt, Clymer Freas, who was intrigued by local groundhog hunters. Clymer gave the hunters a hard time calling them members of the Punxawtawney Groundhog club. 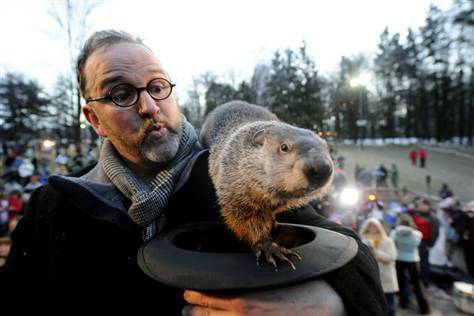 Clymer got pretty into groundhog folklore and decided to write about Punxawtawney's own weather predicting groundhog, over time word spread, other bored and gullible editors reported the story and now we have groundhog day! I know, I sound cynical, its just funny to me to that 30,000 people stand out in the freezing cold to see Phil in all of his infinite wisdom. This is how desperate we are for spring and I am! And so is this guy, Phil is like, woe man! Chill out, I said spring is coming, it's still 20 degrees out! Go shave that stache before PETA gets here and really gives you something to be excited about. Oh, and apparently Phil's prediction is really only accurate about 39% of the time, but I mean who is at that hour? And what could they possibly expect, waking a guy up out of hibernation?